Athleta is widely known for its well made fitness and athleisure wear clothing. As well as a fitness studio that offers dozens of cool classes. But the brand also specializes in non workout specific styles. Their classic pieces are the types of wardrobe staples you want to live in all year long. Comfy sweatshirts, cardigans, and hoodies. The types that make you want to grab a latte and book and get cozy on the couch. Staples like legging style black pants you can literally wear daily. The Athleta winter collection is officially out which means you shop the line, and start your winter hibernation early. I wear my Athleta cross body navy wrap so much I keep it on a nearby hook in my bedroom instead of in the closet. More accessible to grab and go. This winter, I’m obsessed with sherpa style fleece jackets. I’ve seen a few I’ve been coveting but this one from the Athleta winter collection is my fave. And at $108, it’s the best deal too. Nirvana sherpa reversible poncho. Click picture to buy, or shop here. Other highlights from the Athleta winter collection include flannel tops, warm down jackets, turtleneck sweaters (turtlenecks are hot right now!) and more. Start shopping to get your winter wear ready early. More Athleta winter deals below. If you’re not quite ready to think about winter, you can still live in the moment too. In addition to the Athleta winter collection, they’re also offering an array of final sale items at up to 75% off. There is also free shipping for purchases over $50. But act fast because items will go fast. Or, if freebies are more your thing, Athleta has something for you too. In honor of their winter collection, they’re offering a huge giveaway. Enter now and you could win a $50 gift card. See more details below. Giveaway runs till Friday, October 26th at 11:59 PM ET. 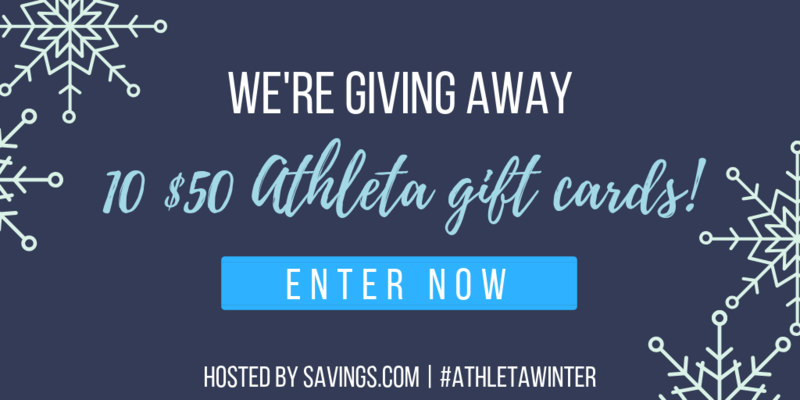 Users enter the giveaway by heading to the Athleta page on Savings.com and submitting their email address on the form at the top of the page. The winners will be chosen through a lottery drawing and notified on Monday (10/29) via the email address they used to enter.